2. Dissolve brown sugar in hot water and let it cool down to around 40C – room temperature (check using a thermometer). Pour into the lower portion of the bottle. 3. 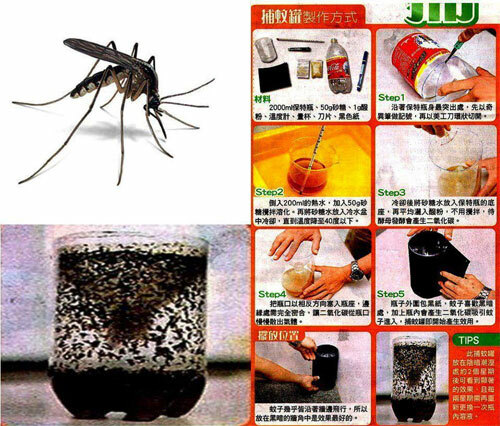 Add yeast to the sugar/water mixture (Carbon Dioxide will be formed and will attract the mosquitoes). 4. Cover the bottle with a dark wrap and insert the top portion upside down (like a funnel). Place it in a dark corner in your house. REPLACE THE SUGAR WATER & YEAST SOLUTION EVERY 2 WEEKS !